I don't think I can even express in words what I thought when I pulled this out of my mailbox, but I will say that I couldn't even walk back to my car without stopping in the middle of the sidewalk, mouth agape in awe, to read the whole thing. Thank you so much, Scrybe! 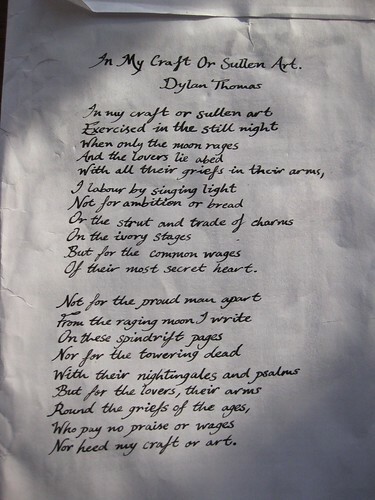 I thought I wasn't a huge poetry fan, but this just blew me away -- even moreso because it was so beautifully written (in fountain pen, OF COURSE!) on the back of the large envelope. AND she sent me paper and envelopes to try out, too. I feel overwhelmingly rich and lucky. Poems in my mailbox from caring people -- that is wealth, richness of value. See? I'm just kind of ruining it by babbling it. Just read the poem again.